It’s been more than fifteen years since I began enjoying sleeping in wild and wonderful places. I guess I’mve spent about a thousand nights sleeping outdoors. Out of all those probably only about ten have been in a ‘proper’ campsite. I’mve slept on top of England’s highest mountain on New Year’s Eve and on the northern tip of Britain in midsummer week. I have also spent many nights without a tent -bivvying- and these are often the most magical of all. (Not always, mind!). I’mve bivvied on hill tops, seashores, even on a swimming platform out at sea and in sewage pipes (clean ones) on three continents! So I know how easy, safe, simple, fun, rewarding and invigorating sleeping wild can be. 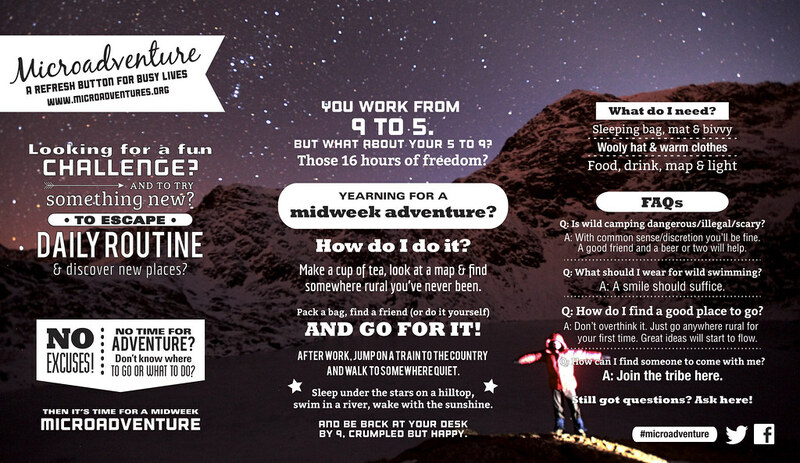 It is one reason why I came up with the idea of microadventures to try to encourage people to give these things a try. But I completely understand how someone who has never done it might think otherwise. Therefore I hope that this article will help encourage wild-campers to give a microadventure a try by explaining how to do it all, and answering a few common worries. If you want to go and sleep on a hilltop this is all you need. The links will help you with buying options. Tell somebody where you are going and when you’ll be back. And then go! Sleeping bag. Don’t buy anything special. Just go with what you have and as many jumpers as necessary. Sleeping mat. If you suspect you will not do a lot of camping just buy one of these cheap ones. Bivvy bag. There are cheap, medium and expensive options. This explains everything you need to know. If you’re worried about rain take a basha too – it’s definitely a worthwhile addition. Wooly hat, even in summer. Toothbrush (put the toothpaste on at home and wrap the brush in clingfilm) and toilet paper. What is a bivvy bag and wild camping? A bivvy bag (bivouac bag) is a waterproof outer layer for a sleeping bag. If you live somewhere it doesn’t rain (ie Not Wales) then you don’t need one, and you can just lie out smugly in your sleeping bag. For a one-off bivvy microadventure a cheap orange survival bag is fine (your sleeping bag will get a bit damp on the outside from condensation). 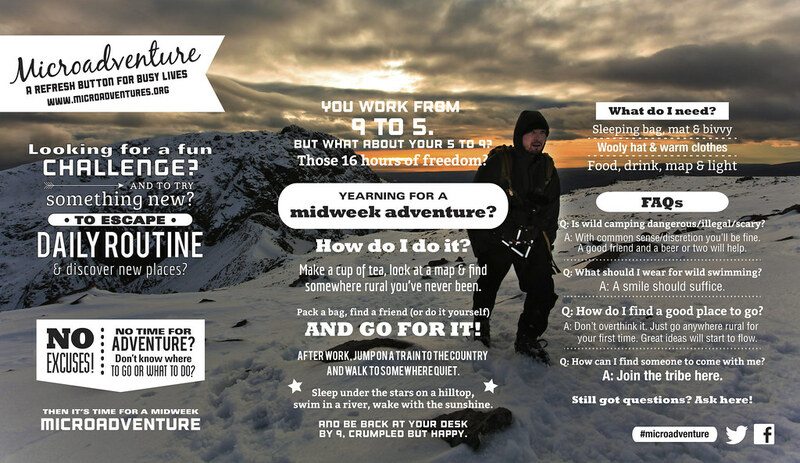 That’s what I used on our howies microadventure last week. A better option is one from Alpkit for about £30. Wild camping is camping away from a proper campsite, out in the wild. It’s completely legal in Scotland and, elsewhere in the world, nobody has ever complained, told me off, arrested me, or been in the slightest bit concerned. 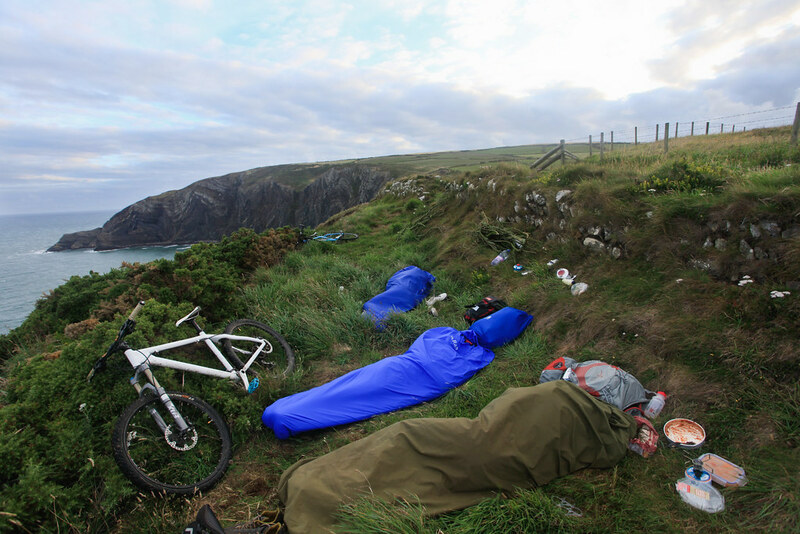 In the same way that nobody would mind you having an afternoon snooze on the beach, nobody minds wild camping, so long as you’re not on private land, near someone’s home, or otherwise being annoying. Assuming you are out in the countryside, away from people then a night out under the stars is about as safe as a night can be. I will admit to the occasional night when strange noises in the woods have spooked me a little, but that is only the fault of an over-active imagination and a youth frittered on late-night horror movies! This goes away after a couple of nights. If you’re out there with a friend it’s even easier. Finding spots to wild camp is an art form! It’s also all about compromise: sheltered in an old barn or under a cliff in case of rain versus a full canopy of stars out in the open if it doesn’t rain. Getting out of the wind will keep you much warmer, so if you’re bivvying on a hilltop (my very favourite place) then consider dropping just a few metres down the leeward side. If you’re sleeping on a beach sleep above the high-tide mark or else you might win a Darwin Award. You can find safe, snug wild camping spots surprisingly close to towns and villages too. Follow a footpath just a short distance away from a road then nip behind a hedge or a clump of trees. You’ll feel very open, conspicuous and slightly silly as you lie down to sleep but you’ll soon relax and enjoy the novelty of being right out in nature. Shove your sleeping bag into the bivvy bag. You can, if you wish, put the sleeping mat in there as well, but I find that’s too cramped. Snuggle in and sleep. If it rains in the night just snuggle even deeper, pull the bag over your head and leave just a little hole for your mouth otherwise you end up getting way too hot! 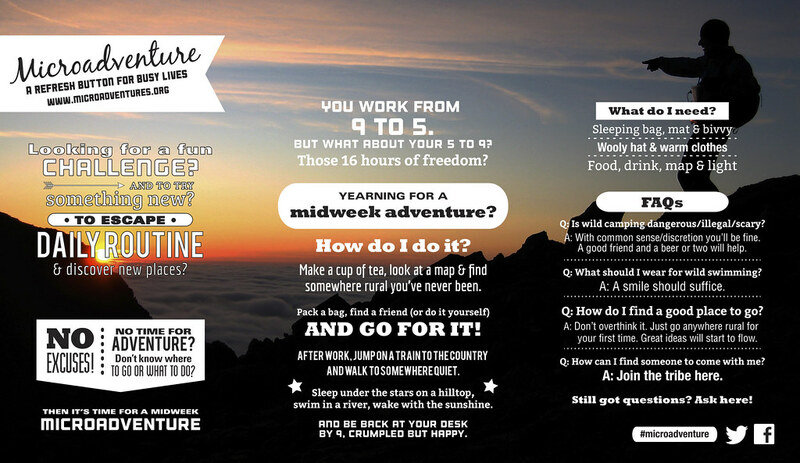 What do I need to take on a microadventure? Find a lake / river / lido / ocean for a quick skinny dip. Pasta and sauce / pesto, Super Noodles, Pot Noodle etc. Even if you have never cycled or walked ten miles before, even if you have never wild camped (or even if you have never camped) I really urge you to give this a try on a nice warm, dry summer’s evening. The very worst thing that’s likely to happen is that you get back to work the next morning a bit tired. Far more likely is that you will be thrilled to discover wildness, nature and beauty on your doorstep. You’ll probably enjoy it so much that next time you’ll take the whole office with you as well! Love the photo. Great write up. Wild camping is certainly ‘the business’. Best night’s wild camping so far I’ve had is in a field in Romania. No sleeping bag, very cold but woke up to a beautiful sunrise and hitched a 1 mile ride up a hill on a horse and cart. The stuff adventures are made of! sounds wonderful Simon, have you written up your adventures? Put a link on your Blog Martin. Hope that’s alright Al, thanks. Just back from my first ever wild camp so this is a nice piece of synchronicity. I’ve learnt a lot, a lot about myself, a lot about wild camping. I could say a lot, lot more about this magical weekend but will write it all up as a post on my own blog. How was the wild camp? Inspired by the Howies trip Alastair that you wrote about last year I’m finally off in 3 weeks time for a Microadventure of my own with some pals I’ve also coerced into it. We’re off to Cornwall where we are going to try some Sea Kayaking and Coasteering in the morning (first-timers), then pick up our rucksacks having survived (hopefully) and hike some miles down the Cornish coastline to then wild camp overnight bivvying out under the stars. Then in the morning we intend to hike for around a further 17 miles south along the beautiful South West Coast Path ending up at a good watering hole! It’s a first Microadventure for some of the lads and a first wild camp for all of us so we’re fingers crossed for the weather. A write up will follow on my blog http://www.jameshandlon.com for anyone interested in finding out how it turns out. Thanks Alastair for the kick up the backside that has inspired us to do something outside of our normal suburban comfort zones. (Although I may not be so grateful after the event, especially if it continues to rain like it is out of the window at present). Fingers crossed you all really enjoy it! That is actually a very good title. That’s a great little article about gear that isn’t actually about gear. Sometimes it is too easy to get hung up on equipment and planning instead of just enjoying the experience. The best overnights I’ve had have been the ones that aren’t so planned. My favourite was when a pal came along to the top of Makara Peak in Wellington – overlooking the city and my house – with a borrowed bivvy bag and a charity shop down jacket. We had a wonderful night watching life below just pass us by. You are Just awesome, buddy…. Come to India, Bro, I will show you wild lions…. Yeah…. Great tips! I went wild camping in Norway a few summers ago and this would have been helpful then. The first night I camped in a farmer’s field, along the coast. It didn’t get dark until midnight and felt like I was on top of the world. I’m writing on behalf of the KEEN Recess Team because we’re inspired by your active lifestyle. Thanks for the great stories. I STILL have never made it to Norway, to my enormous shame! Love the site. Just preparing for my first microadventure of the year……walking round the M60 motorway! I had a quick question, what sleeping bag would you recommend for adventures within the uk? Realistically then I’d just take whichever one you have and as many extra jumpers as you need to make that warm enough for the night. Sorry that this isn’t very helpful! Let me know how you get on with the M60! Cheers Alastair. Sleeping bags certainly seem to open a can of worms when looking around on forums. At the moment, the only sleeping bag i have is a cheap Â£7.99 one from Go Outdoors, so today i have ordered an Alpkit Skyehigh 600 sleeping bag. I will test it out in the back garden once it arrives along with my Zephyros 2 tent. The M60 will be taking place first weekend of May hopefully. Im strangely excited by the thought of it. 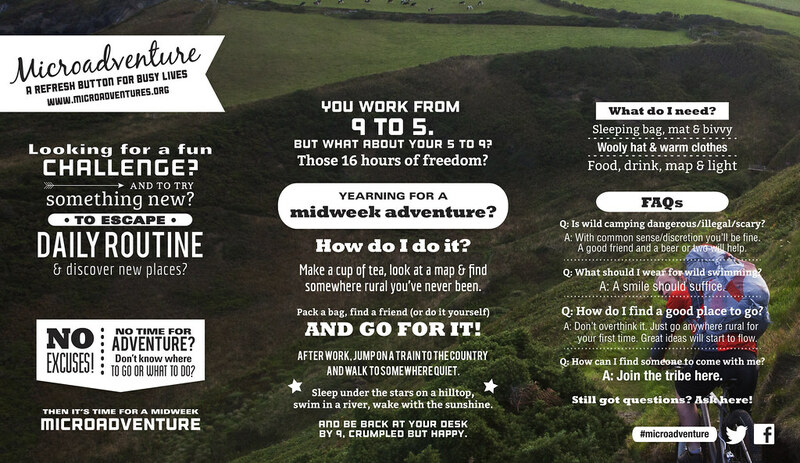 love your site, lots of helpful tips.. i’m embarking on my first micro adventure in the UK.. Have been on plenty camping trips with tents and the kitchen sink… I’m heading for kent downs with bivy bag and about 5 jumpers! and its October!! I am mad? Im trying to stay close to civilisation as a single female in case I chicken out or get freaked in the night. Favourite wild camp was on the small isles of the inner Hebrides, kept lively by sheep and nocturnal mice! Lovely heavy food which we lugged over on a flit boat as there were no shops. Terrible tiny Lichfield tent, but oooooooh the glory of each day! Really glad I found your site, very helpful. Am planning to walk John O’groats to Lands End starting April 2016. Staying B&Bs mostly – but taking sleeping mat/bivvy to stay out, if I need to. Is that and a bivvy bag enough (north of Scotland April/May) ? Or do I def need sleeping gag too ? Definitely need a sleeping bag!